Make an Earth Day necklace with this simple salt dough recipe to celebrate Earth Day with the kids this year. Sometimes we wear our heart on our sleeve and sometimes we wear our planet around our necks. Over the years, we have focused on celebrating Earth Day with various craft projects and activities, but this year I thought it might be fun to make something we could actually wear. 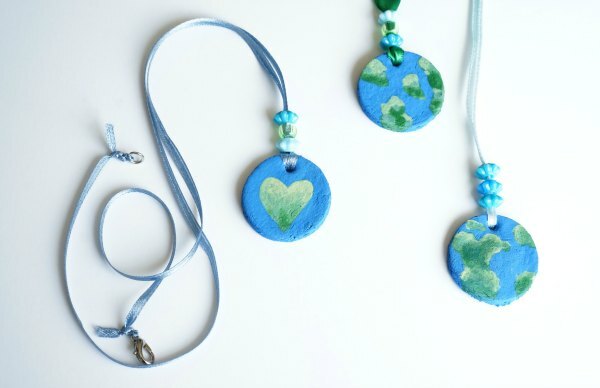 So, we created these lovely and super simple to make Earth Day necklaces. Using our favourite, basic salt dough recipe, this necklace can be worn for many years to come. 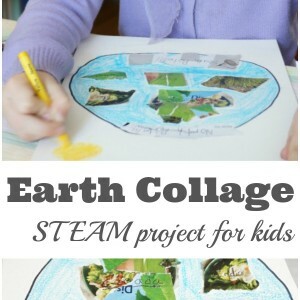 The best part about this craft is how it can be interpreted by kids of different ages. 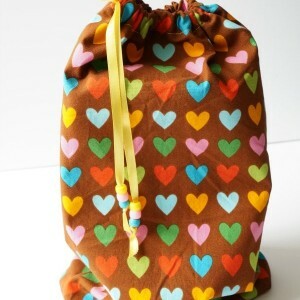 Your kids can personalize it however they like. Maybe add a little star on the planet, to mark where you live? Add more than one pendant to a necklace? No matter how you choose to decorate your little planet Earth, this is a fun way to share the love. Begin by making a batch of basic salt dough. Sift together the flour and salt in a medium sized bowl. Slowly pour in the water into the flour and salt. Stir the ingredients together until a dough forms. Adding the water by tablespoon scoops will allow you to have the most control over the amount of water you add. You may need less or more water. You know your dough is ready when it form a ball and isn’t sticky. 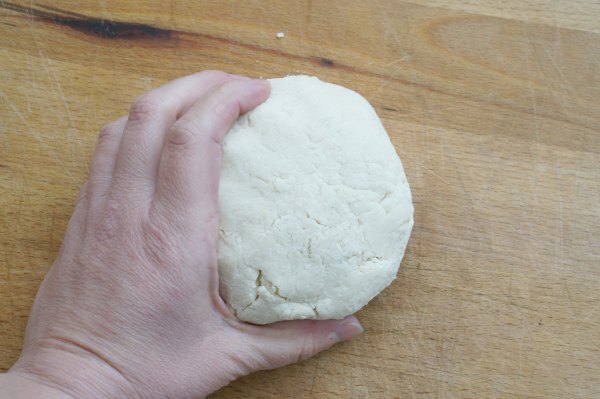 Roll out the dough on a lightly floured surface, to 1/4 inch thickness. 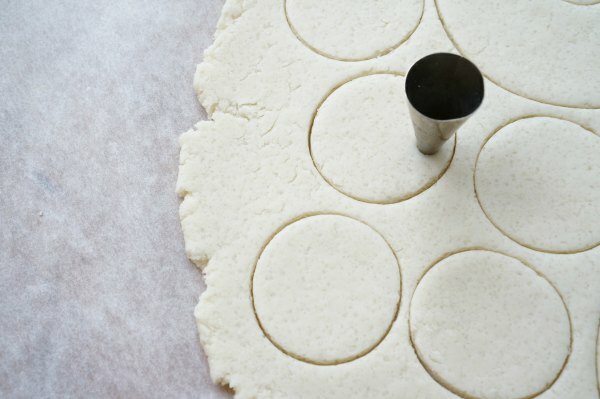 Cut out circles with the cookie cutter. We used a 1 1/4″ cookie cutter for our Earth’s. Choose a size that you like. Use the narrow end of the metal icing tip to cut out the hole for the ribbon. If you don’t have a round metal icing tip, you can use a straw, or even a toothpick. 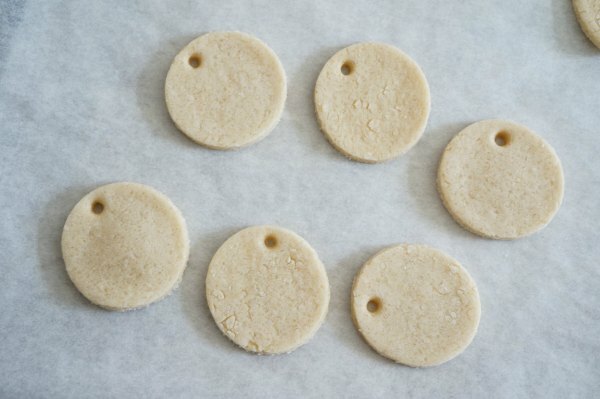 Bake the pendants on a parchment paper lined baking sheet in a 250°F oven for 2 hours. They will become dry and hard. Remove the pendants from oven and let cool completely before painting. How you choose to paint the planets is up to you. We chose to paint the entire planet blue and allow it to dry before adding the green. We created my own variety of shades of greens by combining yellow and blue. Your planets can looks as realistic or unrealistic as you like. Once the painting is complete (don’t forget to paint the back of the pendant). set them aside to dry. How long they take to dry will depend on the conditions in your house. We gave ours about an hour to fully dry. When the pendants have dried, feed the ribbon through the hole in the top of each pendant. Use the beads to secure the pendent in place. 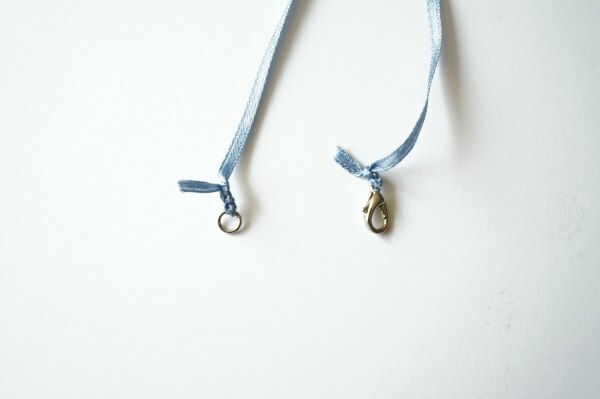 Finally, tie the jewelry loop and clasp to the ends of the ribbon. Be sure to check the length of the necklace before you tie the fasteners in place. We secured the knot with a small dot of super glue. I made these necklaces with my daughters. While they are totally perfect for Earth Day, I think these necklaces are perfectly lovely for any day of the week and anytime of the year. You could add a coat of craft sealant to the clay (like Modge Podge). We liked the rough look of the planets, so we chose not to add the sealant. 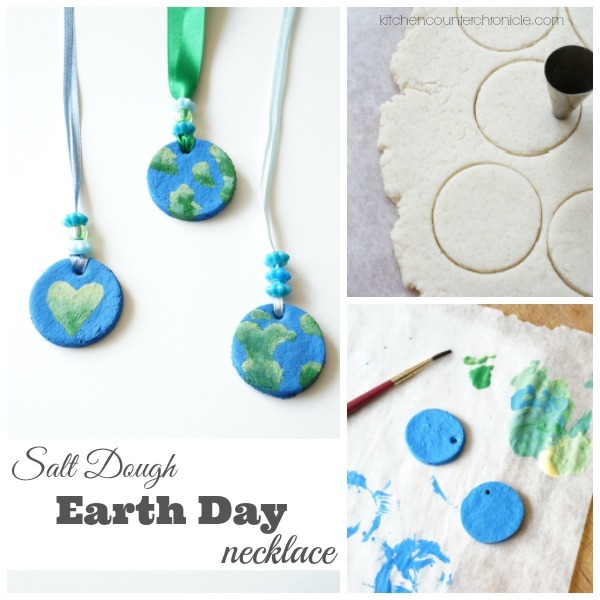 What will your Earth Day necklaces look like? Can I make salt dough ahead of time? Technically, yes you can. Salt dough will keep, wrapped tightly with plastic wrap and then placed in an air tight container. However, due to the salt the dough may dry out and become too brittle to work with. I’d say make it a few hours in advance and keep it wrapped tightly is the best practice. Will salt dough get mouldy? Salt dough that is left sitting around, uncovered, unbaked and unpainted will eventually get mouldy. Once the dough is baked, dried out and painted it should not go mouldy. Can you eat salt dough? Hmm, salt dough doesn’t contain anything that is particularly toxic…however it does contain a high concentration of salt. Therefore, I would recommend not eating salt dough. Ingesting large amounts of salt can lead to other health issues. Best to keep the dough for crafting. 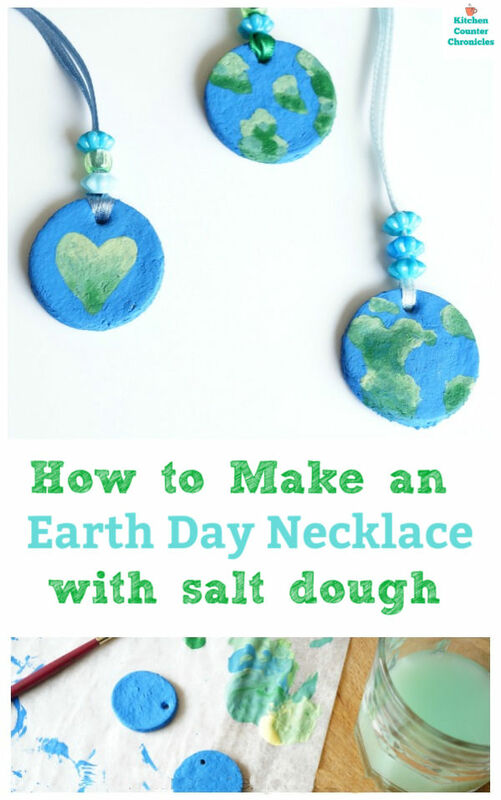 You could always make a batch of our Earth Day sugar cookies if you want to eat your dough! Can you air dry salt dough? Yes, you can air dry thin pieces of salt dough. 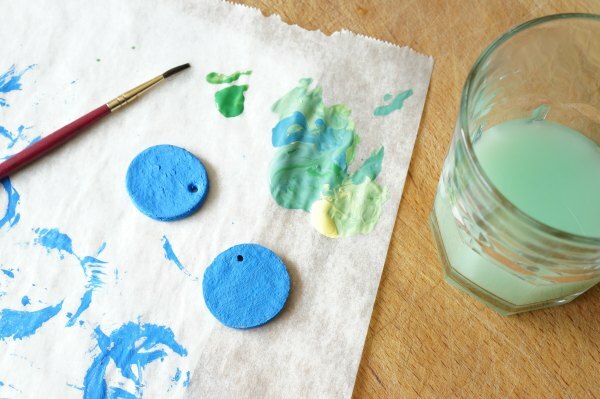 Place your salt dough pendants in a warm, dry spot for anywhere from 3-7 days. Again, it depends on how humid your home is. The easiest way to dry salt dough ornaments is in a low temperature oven. 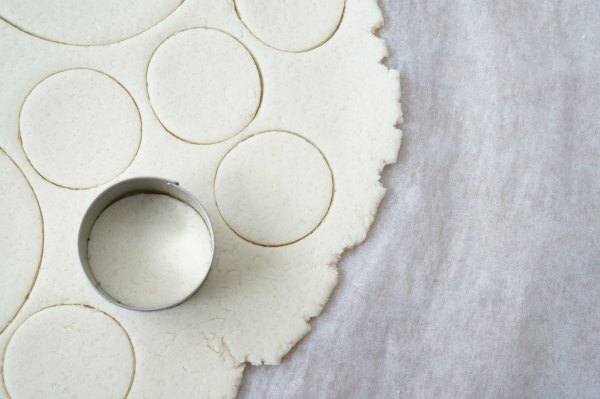 What to do if my salt dough is too sticky or too dry? If your salt dough is too sticky, add a little bit more flour to the dough. Knead in the flour until the dough is no longer sticky. If you salt dough is too crumbly and dry, add in a little more water – a tsp at a time. Your dough is ready when it holds together and isn’t sticky.